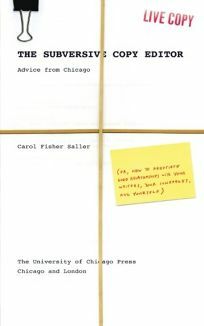 Longtime editor of the Chicago Manual of Style Online's deft, humorous Q&A page, Saller writes with wisdom and a great generosity of spirit in this singular survival guide to the copy editor's trade. Addressing issues essential to these professional perfectionists, who can easily develop compulsive or inflexible practices, Saller's improbably fun text also makes a cagey introduction to the field. Framing each chapter with a choice Q&A from her column (Q: ""Is it ever proper to put a question mark and an exclamation mark at the end of a sentence in formal writing? ""), Saller offers thorough advice on common obstacles, like an adversarial writer-editor relationship, or a seemingly endless task. Tried, somewhat obvious solutions-cultivating positive work habits, examining your motives, organizing your priorities-are thoughtfully re-established for overworked, under-appreciated editors. Practical considerations include the minefield of e-mail etiquette, understanding version control, maintaining transparency and the indispensability of back-up copies. With entire chapters devoted to the freelancer and the writer, and an extensive guide for further reading, this is an ideal complement to any style guide: practical, relentlessly supportive and full of ed-head laughs (A: ""Only in the the event that the author was being physically assaulted while writing"").